In the pastoral history the Fonni’s dog was also known as ancient Fonni’s dog, spinone fonnese by hunters and ancient Sardinian dog by the elders of all counties of Sardinia. The selection of this breed has always been jealously handed down for generations within the same family. The most accepted version of history would descend the Fonni’s dog from these ancient dogs and repeated selections of the local Mastiff dog used in 231 BC by the Roman consul Marco Pomponio Matone to flush out the Sardinian rebels. A study carried out by Prof. Marco Zedda of the Faculty of Veterinary Medicine of Sassari on some bone remains, however, could prove the existence of a mastiff much older that belonged to the nuragic era, as we can see portrayed in some bronze exposed in National Museum of Cagliari. The presence of the fonni’s dog before the Romans arrived in Sardinia is also witnessed by many other archaeological finds. The characteristics of the dog to which belonged the skulls examined are of a dog mesocefalo, which can still be recognized in the dog of Fonni. 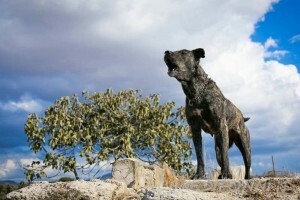 Oral tradition tells that in the island in ancient times there were two types of dog very similar, one typical of the inland areas and another one more present in the Campidano of Cagliari and on the coasts, this one in particular is remembered with the tiger like coat, larger and with the shorter coat. The Fonni’s dog that we know today is believed to be the result of a selection that has used these two phenotypes, thanks to the fact that the shepherds during transhumance used to trade dogs to improve the breed. The Fonni’s dog is mentioned in several documents by writers, historians and poets. The great poet Sebastiano Satta recalls the dog in an ancient Sardinian beautiful poetry dedicated to the dogs sent in the Libyan campaign between September 29, 1911 and October 18, 1912, to conquere the North African regions of Tripolitania and Cyrenaica. Let us quote a short passage. Fonni’s dogs were actually used in Libya to prevent attacks on Italian camps by rebels, thanks to the qualities of ferocity, smell and hearing. We have news of their use even by the Sassari Brigade during World War I and the Guardia di Finanza in 1932 in Tripoli. Even today’ the Fonni’s dog proves to be a trusted companion of the shepherds who continue to select keeping the dog as it was in ancient times , training him according to archaic methods in order to create a true symbiosis between the dog and the property, from the first months of puppy’s life. One animal, if properly trained, can supervise and lead an entire flock.